1 x female thread brass fitting. 1 x male thread brass fitting. 2, Another shape garden hose nozzle can instead of this 2-function,please select nozzle in water nozzle group. 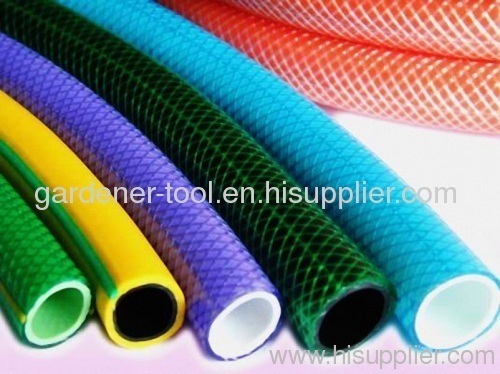 3, Another opiton islength of hose,Customized color,Customized color card with logo. Temperature range:- 10 ℃ to 60℃. For industrial watering,la and garden watering,nursery water supply lines,commercial wash down and golf course water lines. Economical,lightweight and easy to handle. Good resistance to weather aging ozone and ultraviolet light. Brass die-cast connector is strong to support bigger water pressure. 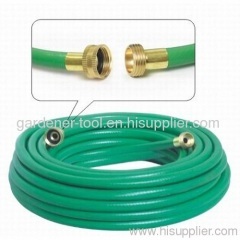 Do you want your garden is most beautiful?Not hesitate,take all of garden tools to irrigate and decorate it with your family.It is a good idear.Not only clean our garden,but also enjoy homely warmth and do exercise.